Deputy Todd Frazier said his dog Lucas knew the difference between real life and training on the night when he was attacked by three men in the woods in Hancock County. Frazier had stopped in a rural area to check on a car and two men came out of the woods and attacked him. When the driver of the car got out, it was three against one, Frazier said, and it was a fight for his life. The three men began dragging Frazier toward the woods and stabbed him in the head, probably with a box cutter, doctors said. The scar is still visible on Frazier’s forehead. Lucas sent those thugs packing. He definitely earned his kibble that night. Authorities have said many times that the men were going to kill Frazier and leave him there. 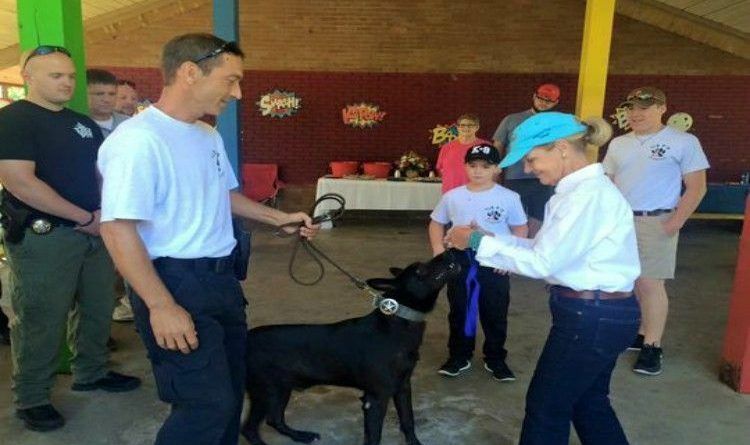 But they didn’t figure on a brave 6-year-old black Belgian Malinois who wasn’t going to let his owner go down without a fight. Frazier said all four of Lucas’ canine teeth were broken in the attack, and he has had dental work to fix them, and all his incisors were broken at the gum line. The muscle that runs down his neck on the left side was detached, and he tore an ACL, Frazier said. Lucas is working on getting back to full speed, and he’s almost there now, but he will go back to search and rescue, which is what he was originally trained in, Frazier said.